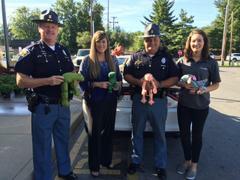 Putnamville—This morning, the Indiana State Police Putnamville District received a welcoming donation of 25 handmade stuffed animals that will be distributed to road troopers to carry in their patrol vehicles for small children in time of need, such as car crashes, injuries, or any other traumatic event. The animals were handmade by offenders of the Wabash Valley Correctional Facility in Carlisle, IN., that are currently in the PLUS (Purposeful Living Units Serve) Program. The program is a faith and character based unit that requires offenders to participate in community service and is a great way for offenders to give back to society. The presentation of animals was made at Baesler’s Market in Terre Haute, as Baesler’s is one of the distribution locations for the Back the Blue stickers, buttons, and key chains. The items can be purchased at minimal pricing with all proceeds benefiting various local law enforcement programs. 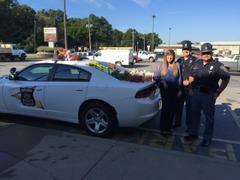 Baesler’s is a community service minded grocery and a strong supporter of law enforcement. The donation was coordinated by Heather Graves of How Charming Photography, who regularly works alongside law enforcement with community based events and is also the organizer and designer of the local Back the Blue items. The attached picture is Left to Right: Sergeant Joe Watts, Heather Graves, Master Trooper Tom Hanks, and Kristine O’Hare of Baesler’s Market. Photo 2 is Graves, Watts, and Hanks.